If you’ve worked in commercial roofing for a while, you know there are many variables that go into sound decision-making. It often comes down to a balancing act of trade-offs: what you get vs. what you give up. That’s no less true for roof pipe supports than for anything else. The fewer roof pipe supports you use, the lower your costs – and the less weight you add to the roof. On the other hand, if you don’t use enough supports, they’ll be spaced too far apart, putting your pipes and supports, as well as the roof itself, at risk. So how do you decide what’s right for your roof? Start by checking your local codes. 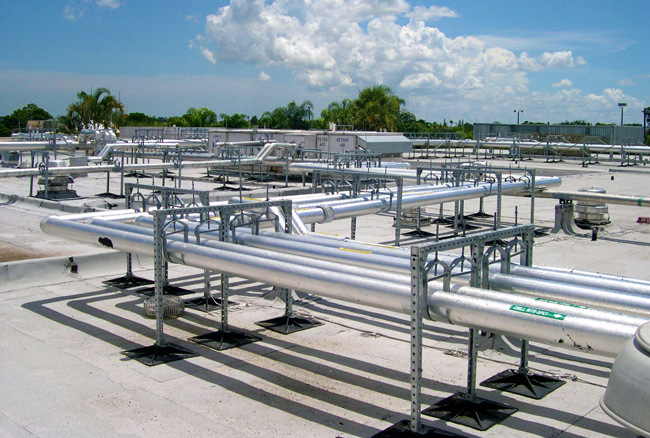 While the standard maximum spacing for roof pipe supports is 10 feet, your community may require more supports and tighter spacing. Pipe size is another critical factor in determining optimal spacing. Typically, the wider the diameter of the pipe, the greater the weight. In addition, wider pipes hold more content, so that adds even more weight. If you live in an area prone to heavy snowfall, you’ll want to factor the weight of that snow into your calculations. The same is true for wind – pipes that have to withstand frequent high wind need more supports spaced closer together. It’s also important to consider the configuration of the piping system. Ideally, you should add a support at or near every change of direction. If that’s not practical, the recommendation is to not exceed 75% of the span that’s allowed on a straight length of pipe. So if you normally have a 10-foot span, a section that includes a change of direction shouldn’t exceed 7.5 feet. 5. Placement of valves, meters, etc. Valves, meters, and other fittings add to the load and should have their own supplemental supports. Another factor to consider is what the pipes will be carrying. If they’ll be carrying a hazardous material or something that could cause a lot of damage to your building in the event of a rupture, you may want to put your roof pipe supports closer together. Some pipes deflect when they get hot. Whether the heat comes from the contents or the ambient environment, hot pipes need more supports to keep them from sagging. The compressive strength of the roof itself is another important consideration. Does your roof get soft when it gets hot? If so, too much pressure on the supports could cause them to sink, damaging your roof. The solution is to space your supports closer together to reduce the weight load on any single support. In addition, always check your warranty before making any changes to your roof. When calculating the number of roof pipe supports you need, it’s always best to err on the side of caution. While going with fewer supports spaced farther apart may require less of an initial capital investment, the potential costs down the road could be staggering.